Romo's microphone went off the air for several plays after he asked if Nantz was jinxing Gostkowski. CBS analyst Tony Romo had an interesting stretch in the first quarter of Sunday’s Super Bowl. 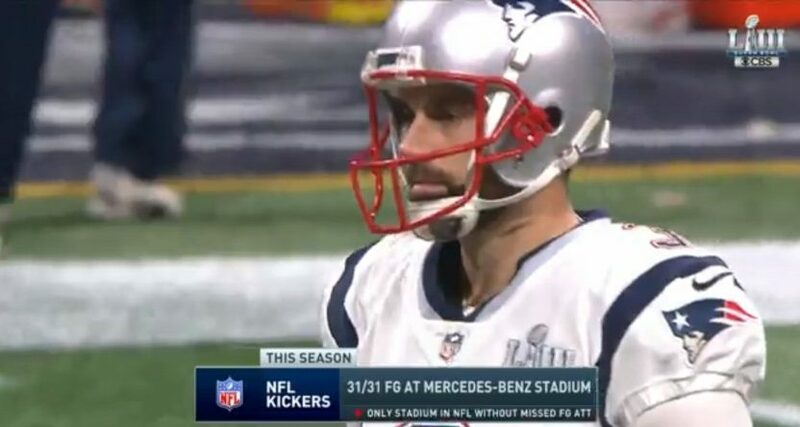 Romo first asked if play-by-play broadcaster Jim Nantz was jinxing a field goal attempt from New England Patriots’ kicker Stephen Gostkowski by pointing out that no kicker had missed a field goal or point-after attempt in Atlanta’s Mercedes-Benz Stadium all season. Gostkowski then went on to miss, and CBS went to commercial; when they came back, Romo was silent for a couple of plays before returning to the broadcast and explaining that his microphone had cut out. It’s unclear if Romo’s mic wasn’t working here and this was cover, or if his mic was working and they just decided to get the Gurley report in. In either case, the play after this saw just silence after Nantz’s call of the play. Maybe Romo’s equipment reacted negatively to him accusing Nantz of a jinx. Or maybe this was just due to random fluctuations in the space-time continuum. Either way, it made for something pretty unusual.